If you are planning to visit P aris, you definitely need to book your tickets in advance. Firstly with your day-to-day planning fully defined you will not loose your time while in Paris, figuring what to do and visit. Secondly you need fast-track entry tickets to skip the line. 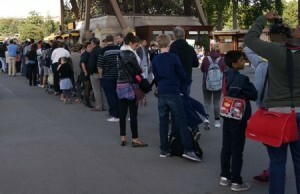 For instance, queue for the Louvre can be up to 1h 1/2, for Eiffel Tower 2h and Versailles: 2h in Summer. The Paris Pass worth it? One option is to book The Paris Pass which includes museum entry, public transportation within Paris center and a few extra. The only problem with The Paris Pass is the price, at € 117 for a 2-day Adult Paris Pass ( €173 for 4 days) you will better book your tickets one by one. Besides you will pay extra to go to Versailles, access the gardens and The Paris Pass does not include any Eiffel Tower access. And for transportation, you will need a bundle of metro tickets (“un carnet”), that will definitely be enough. Don’t forget to keep a few hours for shopping on the Champs Elysées, walking in Montmartre’s small streets, entering Notre Dame Cathedral (free entrance) and a few additional city walks you can do for free. A tailor-made Paris Pass with all the above will cost you €100/110 and €110/120 if you add the train to Versailles, still less expensive than The Paris Pass. How can you book your tailor made Paris Pass? Click on the button below, fill in the form with your travel dates, contact details and tastes. We will build your tailor-made Paris Pass in a few hours and book all your tickets for you.